Silicon Valley startup Ausra fired up a five-megawatt solar power plant outside Bakersfield Thursday, the first big solar station to go online in California in nearly two decades. Ausra has a 20-year contract with utility PG&E (PCG) for a 177-megawatt solar power plant to be built some 70 miles away on the Carrizo Plains in San Luis Obispo County. But like competitors who also aim to sell solar technology untried on a large scale, Ausra constructed the demo plant, called Kimberlina, as a proof of concept for investors who will have to be persuaded in these tight times to pony up half a billion dollars or more in project financing. “It’s important because this is the technology banks’ engineers want to see so they’re comfortable recommending financing for the Carrizo Plains site,” Ausra CEO Robert Fishman told Green Wombat. While Ausra built Kimberlina to show that its compact linear fresnel reflector technology can generate utility-scale electricity, the plant is also designed to demonstrate that solar tech can be deployed for other industrial uses. 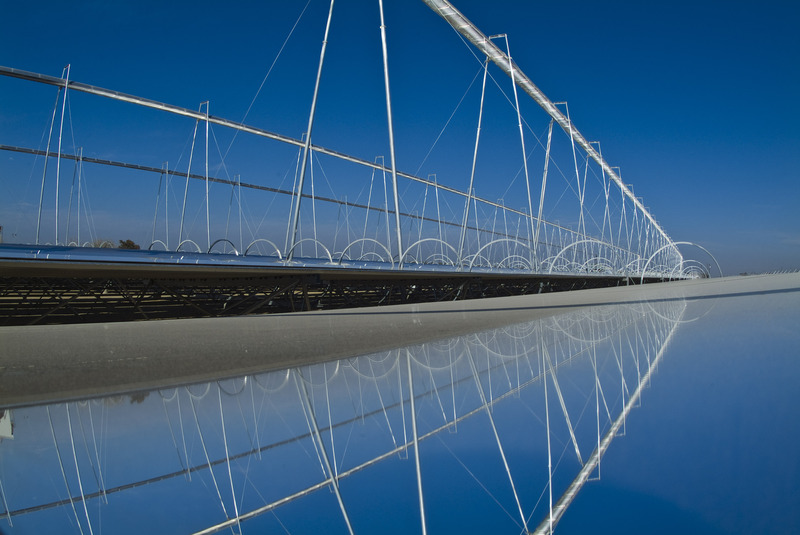 At heart, a solar thermal power plant is a steam machine. In Ausra’s case, long rows of flat mirrors that sit low to the ground. concentrate sunlight on water-filled pipes that hang over the mirrors to create steam. That drives an electricity-generating turbine, but Ausra and other companies are looking to sell the steam as well. For instance, take a drive around Bakersfield and you’d think you were in Texas, what with all the oil rigs rocking back and forth across a treeless landscape. Bakersfield oil is thick and heavy, so steam is injected into the ground to make it flow. Fishman wants oil companies to stop burning expensive natural gas to boil water and start using the sun. Each 1,000-foot row, or line, of Ausra mirrors generates six megawatts of heat, according to Fishman, who says the company has talked to potential clients who would need anywhere between five and 50 lines. Ausra also is exploring other markets for its steam technology, such as food processing. Rival power plant builder eSolar, the Pasadena startup incubated by Bill Gross’ Idealab and funded in part by Google (GOOG), also sees other markets for its green tech. Last month, eSolar, which has a contact to supply utility Southern California Edison (EIX) with 245 megawatts of electricity, licensed its technology to stealth renewable fuels startup Sundrop, based in Pojoaque, N.M., north of Santa Fe. Besides using solar energy to produce such fuels as hydrogen, Ansari, like Ausra, sees the oil industry as a potential market. He says the food processing and fertilizer industries also could substitute eSolar’s technology for natural gas to make steam. Back in Bakersfield, California Governor Arnold Schwarzenegger presided over the official opening of Ausra’s Kimberlina solar plant on Thursday. (Live streaming his appearance.) “California is going green and it’s going green really fast,” the governator said before an audience that included PG&E chief executive Peter Darbee and Silicon Valley venture capitalists Ray Lane and Vinod Khosla. The solar power station is plugged into the grid and will supply PG&E with enough electricity to power about 3,500 homes in central California. The mirror arrays were made at Ausra’s robotic factory in Las Vegas. Schwarzenegger gave the signal and Kimberlina officially came online, the 1,000-foot-long mirror arrays rotating toward the sun. 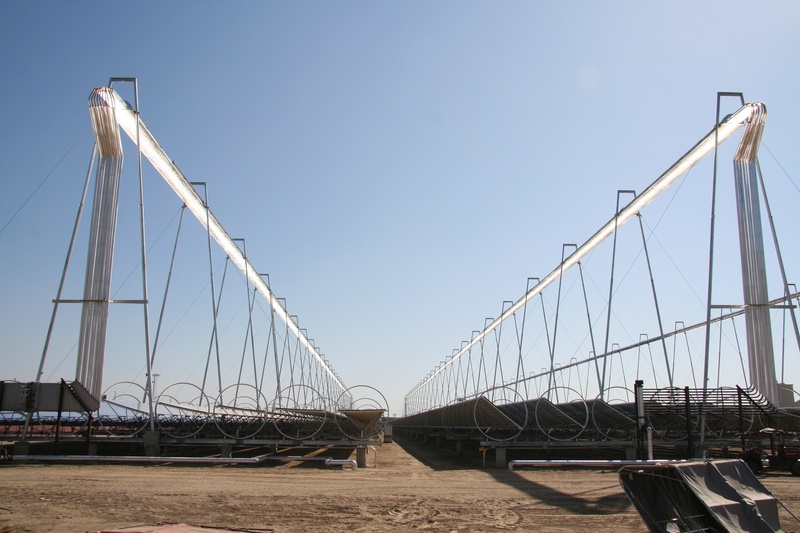 Sundrop’s SOLAREC stands for solar reduction of carbon dioxide. Reducing carbon dioxide would give you carbon monoxide. Add some hydrogen and you have syngas and the ability to make synthetic hydrocarbons through the Fischer-Tropsch process. Syngas can also be used to create methanol, which then can be converted to gasoline through a process developed by Mobil decades ago. I think Sundrop is working on a bit more than just hydrogen. Instead of sending oney to the Midlle East. The feds should pay for any homeowner who wants a solar system. The benefit is two fold. One it will lower our dependance on Mideast oil and it will create tons of construction and tech jobs which will stimulate the economy. If the government is serious about security and energy independence than solar is the way to go. How more decentralized can power distribution get than to have each building generating it’s own power with solar?